Humanized model organisms are powerful biological models that allow scientists to study human disease genes in simpler contexts without losing the value of in vivo studies. Video: “Gene-Swap”. The human coding sequence of STXBP1 was inserted into the native locus of C. elegans otholog gene. The worms version of the gene is replaced with a human coding sequence. The Gene-Swapped STXBP1 sequence functions and shows a significant level of activity (left). In contrast, the knock-out shows very little activity (middle). For the R406H genomic variant, its activity is somewhere in between the “humanized” and “knock-out” strain (right). In either C. elegans or Zebrafish, a native model organism gene can be replaced by a human gene with the same biological function. Mutations can be introduced into the human gene in order to make a disease variant. Alternatively, the human gene can be expressed in specific tissues or stages of development (see figure 1 below). We offer end-to-end services to obtain fully analyzed phenotypic data. Contact us for more details. Patient Allele Analysis - Functional analysis of patient genomic variants through phenotyping of a model organism to determine pathogenicity. C. elegans Phenotype Analysis - Full phenotypic analysis of your C. elegans transgenic and obtain measurements of the functional output of your C. elegans strains. Figure 1. We excised a crucial gene (2) from control worms (1). This lead to a 75% reduction in motility of knock-out worms (white bar). 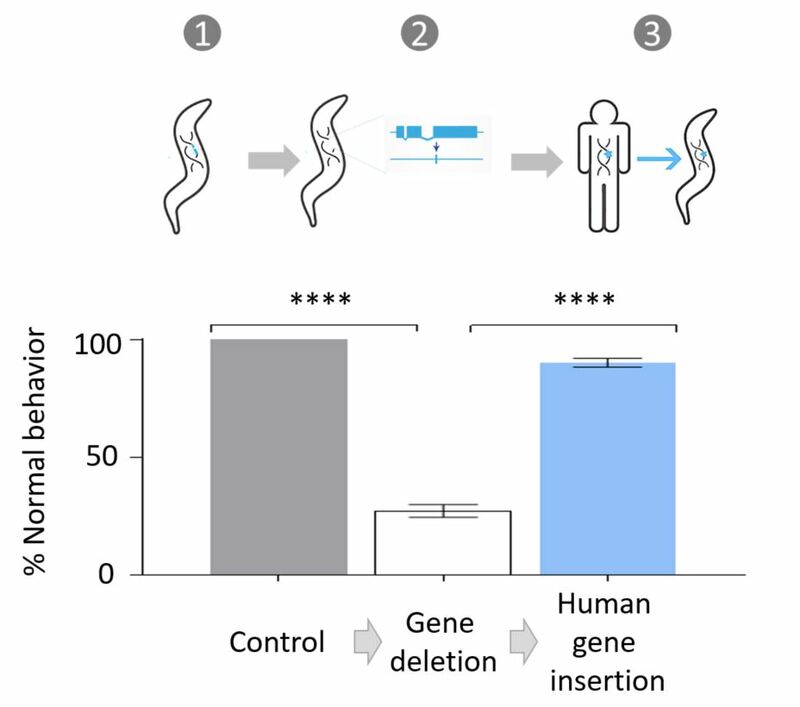 By inserting the human homolog gene in those knockout worms (3), we restored the worms’ normal locomotor activity (blue bar). This experiment demonstrates the power of C. elegans as a human proxy for disease-oriented research. ****p<0.0001, average 50 worms per well. Baruah et al. Expression of human Bcl-xL (Ser49) and (Ser62) mutants in Caenorhabditis elegans causes germline defects and aneuploidy. PLoS One. 2017 May 8;12(5):e0177413. Piazzesi et al. Replication-Independent Histone Variant H3.3 Controls Animal Lifespan through the Regulation of Pro-longevity Transcriptional Programs. Cell Rep. 2016 Oct 18;17(4):987-996. Generating lines that expressed the human version of Bcl-XL, an anti-apoptotic protein enabled the publication of Expression of human Bcl-xL (Ser49) and (Ser62) mutants in Caenorhabditis elegans causes germline defects and aneuploidy by Baruah et al. In addition, a variety of Bcl-XL mutations were also integrated into the genome of the worm by NemaMetrix. This graph shows reduced progeny production when a variety of Bcl-XL mutants are expressed in worms. Making these mutations in the human Bcl-Xl Serines has a dominant effect on the C. elegans phenotype. Dr. Parker and his colleagues are using these C. elegans strains to better understand Human anti-apoptotic protein function and as a target for drug screening. 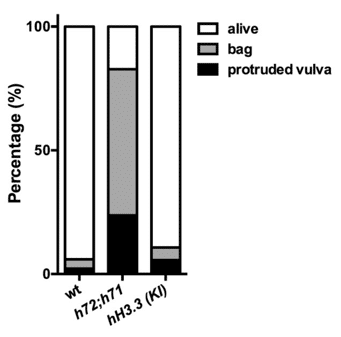 NemaMetrix built a line expressing the human H3.3 protein enabled Piazzesi et al. to study the H3.3 histone variant in C. elegans. They found the loss of function mutant displayed a strong “bagging” phenotype, where the eggs hatch inside the animal’s body. When they tested these animals they found that the human H3.3 suppressed the bagging phenotype of the mutant. Below figure illustrates progeny production. The results are published in Replication-Independent Histone Variant H3.3 Controls Animal Lifespan through the Regulation of Pro-longevity Transcriptional Programs. Cell Rep. 2016 Oct 18;17(4):987-996. How C. elegans are used for disease research? We offer a variety of humanization service packages to fit the needs and budget of your lab. Choices range from the fast, affordable Custom Injection Mix to the comprehensive Full Build service package, allowing you to customize the components you need to accomplish your gene editing goals.